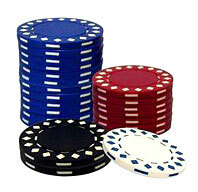 Blue Chip Stocks: Is it a poker game? Historically, investing in stocks has generated a return, over time, of between 10 and 15 percent annually depending how aggressive you are. Stocks outperform other investments since they incur more risk. Stock investors are at the bottom of the corporate “food chain.” First, companies have to pay their employees and suppliers. Then they pay their shareholders. After this come the preferred shareholders. Companies have an obligation to pay all these stakeholders first, and if there is money leftover it is paid to the stockholders through dividends or retained earnings. Sometimes there is a lot of money left over for stockholders, and in other cases there isn’t. Thus, investing in stocks is risky because investors never know exactly what they are going to receive for their investment. Good long-term rates of return. Unlike mutual funds, another relatively safe, long term investment category, there are no ongoing fees. You become a part owner of a company. Very actively traded so, easy liquidity. So much for the benefits – what about the risks? Some investors can’t tolerate both the risk associated with investing in the stock market and the risk associated with investing in one company. Not all blue chips are created equal. If you don’t have the time and skill to identify a good quality company at a fair price don’t invest directly. Rather, you should consider a good mutual fund. Selecting a blue chip company is only part of the battle – determining the appropriate price is the other. Theoretically, the value of a stock is the present value of all future cash flows discounted at the appropriate discount rate. In reality supply and demand for a stock sets the stock’s daily price, and demand for a stock will increase or decrease depending of the outlook for a company. Thus, stock prices are driven by investor expectations for a company, the more favorable the expectations the better the stock price. In short, the stock market is a voting machine and much of the time it is voting based on investors’ fear or greed, not on their rational assessments of value. Stock prices can swing widely in the short-term but they eventually converge to their intrinsic value over the long-term. You are right to say that stock price tend to appreciate in the long term. Blue chip are very safe, however returns will not be spectacular. One trick I’ve learnt – invest in blue chip, especially government linked companies ones, whenever in a time of sudden disaster, disease breakout, or even terrorist attack. These cases are usually short term in nature, and you will expect panic selling in such situations, and this give rise to great profit opportunity. We have to bear in mind that fundamentals of good government linked blue chip companies do not turn bad overnight, and that the government will usually not allow them to fall. So you can expect their price to return back to normal and appreciate in due time. This strategy never fails to work – buy blue chip in times of sudden crisis (which are short term in nature). Thanks for sharing you valuable views here. You are right, the returns on Blue Chip stocks may not be spectacular, but they are modest returns anyway. Blue Chip stocks also offer stability to your portfolio. Some blue chips offer generous dividend return, so that will be a good source of additional income, on top of capital gains. In fact, I know of investors who invest sorely on high dividend paying companies just for the dividend revenue. Companies with strong fundamental history paying an excess of 6% dividend rate will not be too hard to find. Those will be good ones to look out for. You are absolutely right Jag, a lot of blue chips have a good dividend paying history, thats also the reason that generally investors stay loyal, paying dividends generates investor confidence. Investing in blue chip companies can yield income as well as capital appreciation. Great post man, I agree. That sounds interesting. Found your blog through Google, you got some good rankings!